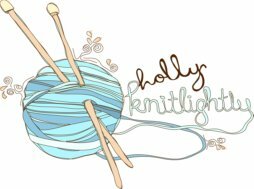 Holly Knitlightly: It's In The Bag! 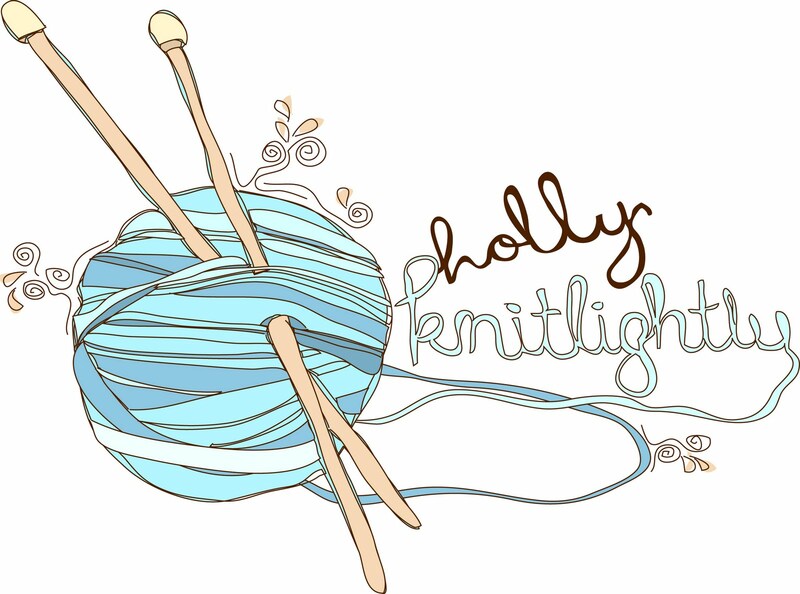 Today is my turn to participate in the Blog Crawl that Ashley from A Hasty Life put together! 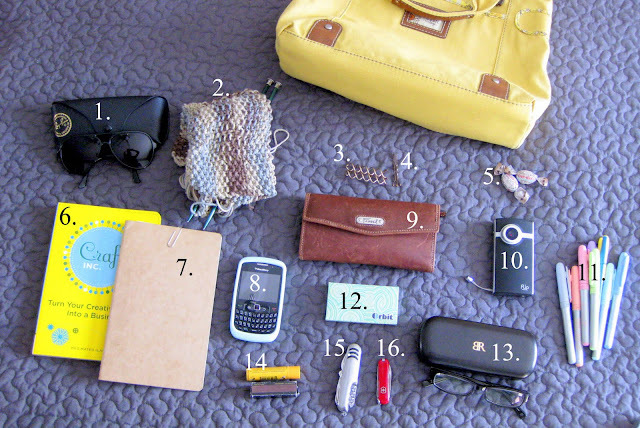 I'm in group five, and yesterday you got to see inside Caroline's bag, and tomorrow you can check out Kate's bag! 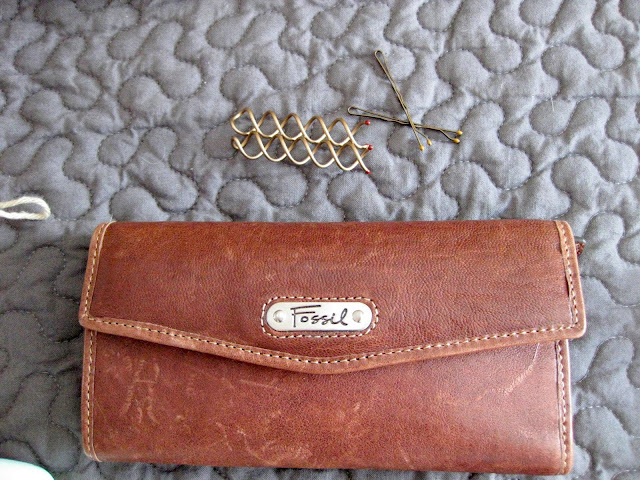 When I was in the States a couple of weeks ago, I stopped at Fossil and picked up a new bag & a new wallet! Finally, I can stop using my LITTLE sister's old wallet, ha! Here is the inside of my (always jam packed) bag! 1. My prescription sunglasses... I LOVE them. Haha it's so nice to be able to see while wearing them. 3. Spin Pins! I picked them up when I was in the States & I LOVE 'EM!!! They work so well, haha. Maybe because my hair is really long & all one length... but I love them. 6. Craft Inc. Book, packed with tons of information! 9. My new walllllllet, love it! It's so soft. And so light, I threw all my change into my California Fund, haha. 10. 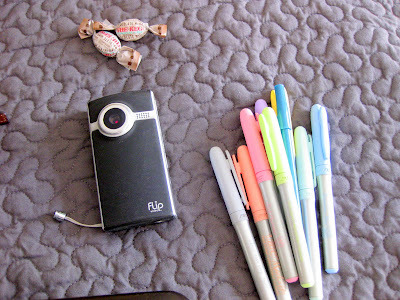 My flip camera, I really need to upload some videos & share them with you guys! 11. My bic markers & pens. Hahaha I always have some sort of colouring tools with me. 14. Chapstick (Burt's Bees, haha this is my "makeup".) and a box of matches from when I was in Chicago. 15. My pocketknife from Pike, haha. 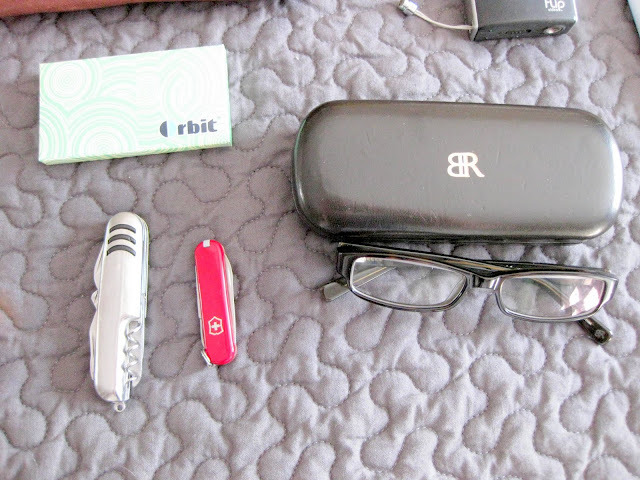 When we were camping he let me borrow it, then he said I coudl keep it since I always wanted a pocket knife. 16. My mini Swiss Army knife. Keith and I went out one day and he bought me it, haha. So now I've got two pocketknives! The only thing I use them for is to cut yarn, haha. But I use them a LOT. 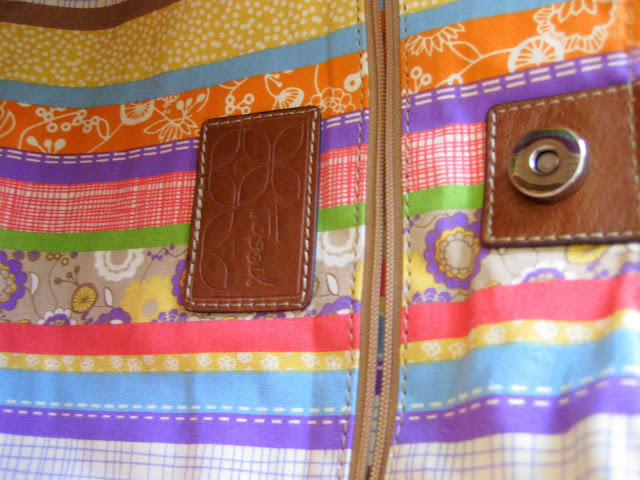 I love the lining of the bag! Haha hope you guys enjoyed getting a peek into my bag!! (And if you haven't checked it out yet, look at my post for "Dress Up Your Pet Day"!) Hope you guys have a great night! Thank you so much for participating in the blog crawl!! I love your bright yellow bag!! It is so pretty! I'm also eyeing your way cool Ray Bans...love those!! Is that a new style? I haven't seen those!! 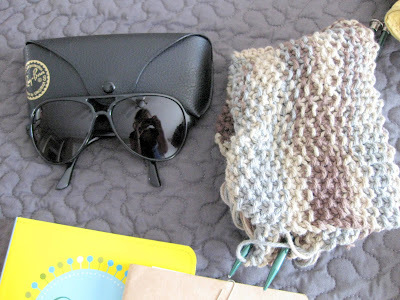 love that you carry your knitting around! and do you totally love your FLIP? i have the same one - love it and should use it more often. cute bag btw, friend!! 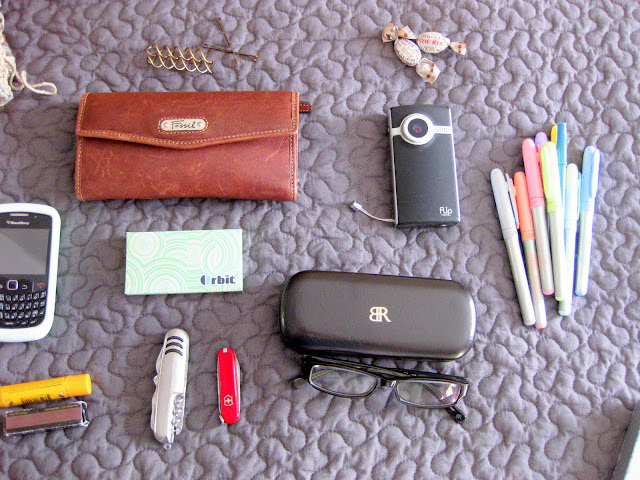 Your purse is SO cute! 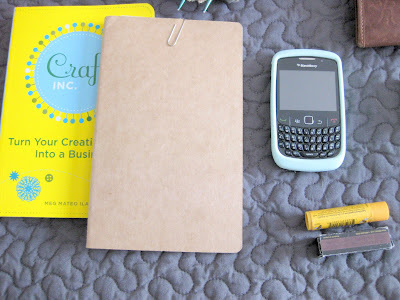 And I've been meaning to read "Craft, inc" :). Also, I love that you carry your knitting with you! I LOVE your purse and wallet!! Fossil is AMAZING!!! I have a wallet and a few purses from them and i just adore thim!!! HAve a wonderful weekend my dear!! Love the lining of the bag! I want a Flip cam soooo badly. Awesome! That bag and wallet are so cute! I need to pick up a Spin Pin, I feel somebody else did a post on them within the last few months. Must find! How do you like the flip? Is it only for video or can you use it to take photos? It's a pretty good price if you can use it for both. I saw the spin pins and want to try them out but I don't know how or what to use them for.